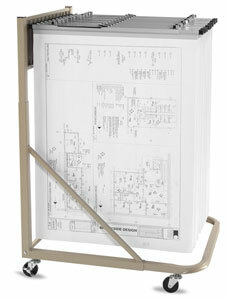 These wall racks and plan centers are economical and great for storing artwork, drawings, prints, blueprints, and more. These extended anodized aluminum clamps securely hold up to 100 sheets without punching or stapling. Heavy-duty chrome-plated steel wing knobs open and close the clamps, and an internal steel spring holds them open for easy loading. Chrome-plated steel clips include a spring to clip onto pivot brackets. Each clamp includes a clear, plastic, snap-on label holder. Available in 18", 24", 30", 36", and 42" (46 cm, 61 cm, 76 cm, 91 cm, and 107 cm) lengths, Brookside Design Hanging Clamps are also compatible with other major manufacturers’ vertical files.